The early morning dip was bought and the Nasdaq closed positive. Friday wa a decent day with a sharp decline at the open as the remaining sellers exited the market. The dip was bought but not on high volume. It was just enough to put the S&P and Nasdaq back into positive territory but the Dow still lost 60 points. 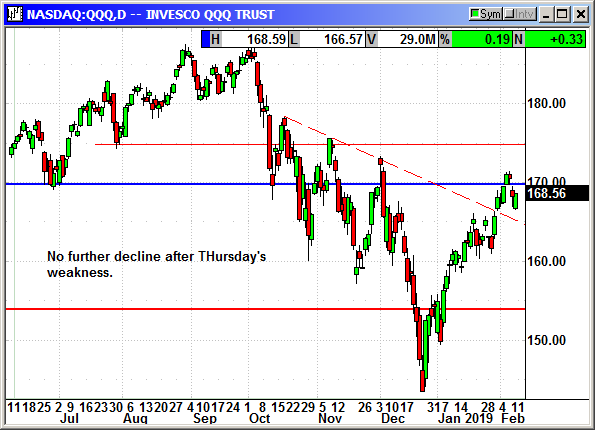 After Thursday's big drop and Friday's early weakness, the rebound ahead of weekend event risk suggests the sellers have left the building. Dell said it was exploring the sale of SecureWorks (SCWX) with 4,300 clients in more than 50 countries. Dell bought the company in 2011 for $612 million then spun it off in 2016. 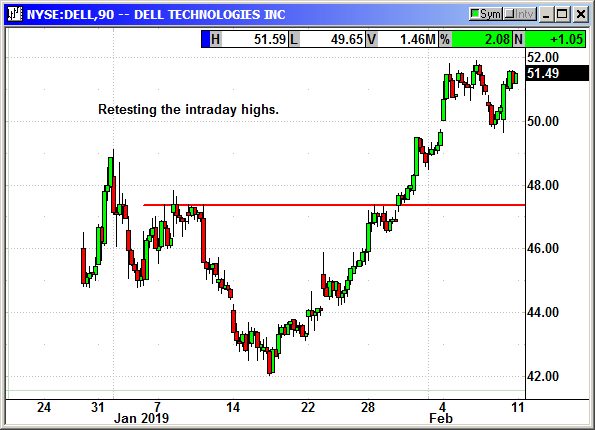 Dell still owns 85% if the stock. The company only has a market cap of $254 million but Dell thinks it could be worth $2 billion. Dell has more than $50 billion in debt. Merck said the FDA had accepted and granted priority to applications for two anti-bacterial drug candidates. One is for pneumonia and the other for urinary tract and abdominal infections. 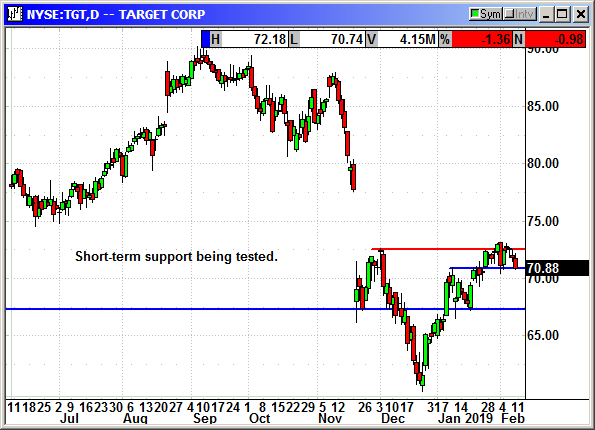 Shares rallied 70 cents in a weak market. Shares are still $2.48 OTM. 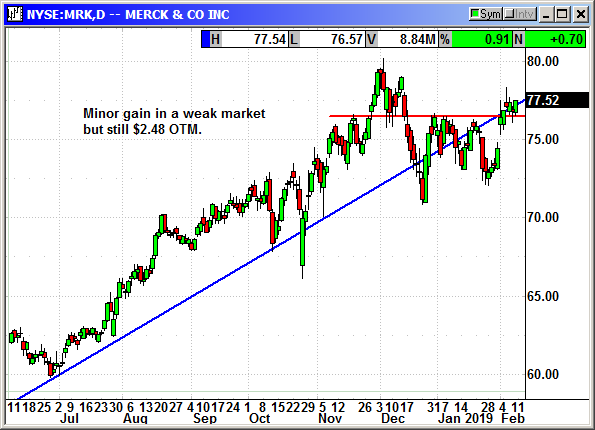 Update 2/2: Merck reported earnings of $1.04 that beat estimates by a penny. Revenue rose 5% to $10.99 billion and beat estimates for $10.95 billion. Sales of Keytruda rose 66% to $2.15 billion. They guided for 2019 earnings of $4.57-$4.72 on revenue of $43.2-$44.7 billion. Analysts were expecting $4.69 and $44.2 billion. Shares spiked $2 but it was not enough to reflate the option. I am not dropping it because as positive market could do wonders with two weeks to go. We are only $3.50 OTM. No specific news. 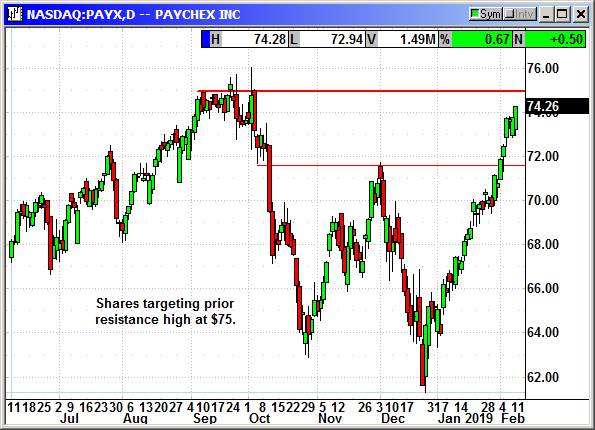 Shares approaching the prior high at $75. 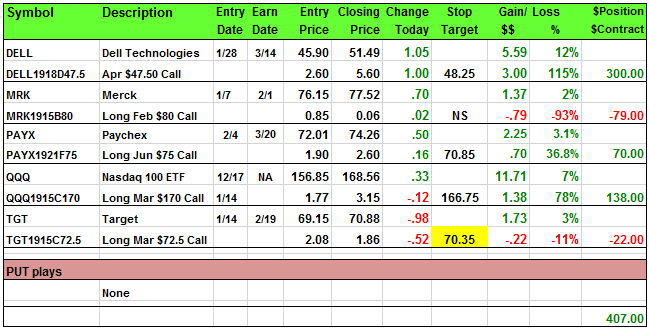 Long June $75 call @ $1.90, see portfolio graphic for stop loss. Early morning dip was bought, and the Nasdaq posted a minor gain. No sellers in sight. Target updated their app to note if the price was online or instore after researchers found that prices could vary greatly depending on how close they were to a store. Target said the lower prices indicated online price matching but the higher prices close to a store represented the shelf price in the store. Regardless of the reason for the app's programming, the publicity is pressuring the stock. Update 2/2: A researcher found that Target's mobile shopping app charged more for products if you were near a store than if you were far away. Researchers found that a 55-inch TV was $499 if you were some distance from a store but when you pulled into the parking lot it rose to $599. They found this on multiple products. Shares fell $2 on the news.